Video conferencing interviews are frequently conducted by organizations looking to hire new people. This method is used most frequently when hiring mid-level professionals and employees who will remain at their remote location. 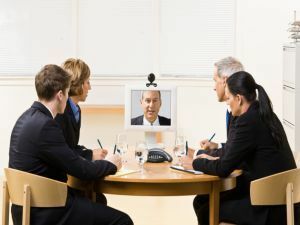 While getting interviewed through a video conference might at first seem more strained and restricted than a face-to-face meeting, you will come to appreciate the special advantages of the medium. Of course, you would need to familiarize yourself on how to handle video-conferencing interviews and make sure to come across as professional, taking steps to make sure your communication will be effective. You would also need to get acquainted with the conferencing program that will be used. For instance, Blue Jeans Network allows for multi-party participation, rich content sharing, and device interoperability. Knowing this will help you be prepared to be interviewed by a whole panel instead of just one person, and it will also enable you to prepare your own materials better. Since you now know that you can share rich content, you need not hesitate about showcasing heavier files that form a part of your portfolio if the opportunity should arise. Name and save all files in a separate folder if you think you may use them in the course of the interview. This will save you from frantically running searches, which could take time and may create an unfavorable impression. You don’t need to be a multi-national corporation to think globally. There are many types of small businesses and professionals who can benefit from using video conferencing services. While the benefits of these services for large organizations tend to be more obvious, it would be unfortunate if small organizations and professionals did not also realize its potential and employ it to expand business. For instance, a freelancer will find a whole world of opportunity open up and could use video conferencing for interviews and to stay connected with potential clients located anywhere in the world. As people looking to hire contractors who are remotely located only increases, the need for these contractors to be accessible and always open to communication is crucial. Freelancers of all kinds will find that they will have an edge over competing professionals if they put themselves forward and communicate their willingness to stay connected through video conferencing. Freelancers and other professionals can not only use video conferencing to get interviewed, but they can also continue to use it to telecommute. While email will probably be the primary mode of communication, professionals who demonstrate their openness to conferencing technology will have a leg up. Employers like to know that if the need arises they can easily communicate with their employees without necessarily having to go through the rigmarole of sending emails, waiting for replies, and so on. Telecommuting is the next best thing to a face-to-face sit-down, and recognizing this could go a long way in getting your career started. Certain types of professionals and small businesses can also get work by using video conferencing technology to get noticed by potential clients and employers. With Blue Jeans Network offering the option to record meetings and webinars, for instance, professionals will find that they can promote themselves better by holding training sessions or webinars in their area of expertise, recording these, and sharing them on their professional pages. For example, a trained architect might hold a webinar on architecture styles in a particular city and invite various stakeholders to attend. This could later be shared on various platforms, getting the architect more attention and, if done well, a lot of job offers. Before jumping into this space though, any professional should first read up a little on how to run a powerful webinar. It is important to not come across as uninformed or nervous. There could be nothing worse for your career than a bunch of false claims to industry expertise. Your stakeholders will see through pretensions, and you can best benefit from video conferencing by organizing webinars that genuinely reflect you expertise and experience. Professionals of all kinds who are looking for work will find video conferencing a novel strategy to accessing global markets and reaching potential clients and employers. Not only does it facilitate the interview process and make telecommuting simpler, but it is also an effective marketing tool, granting you the visibility you feel you badly need. How has Video Conferencing Evolved to Deliver an Improved Meeting Room Experience? Video conferencing may be the next best thing since sliced bread. I have gotten jobs all over the world thanks to my ability to meet face-to-face over the internet.